Spring this year has been hit and miss, with very few warm days. Any nature lover with a flexible schedule would have headed to a favorite birding spot when the temperatures promised to reach 75 degrees on a sunny day. For me, that's Sandy Hook. It's one of the state's top birding spots any time of year, but during spring migration, it's especially promising. I had no specific reason to believe it would be spectacular today, but you never know. And to paraphrase a popular saying, a mediocre day at Sandy Hook is still better than a great day in a lot of other places. What I didn't realize was that my visit would land me a screen test for a remake of a Hitchcock movie. No, not Psycho (I'm not that obsessed with birding). Yes, The Birds! Now, over the past several years, Ivan and I have seen plenty of large flocks of small avian visitors, and smaller flocks of large avian visitors, and sometimes they take flight in ways that might be scary to those who aren't familiar with their general behavior. Like anyone else would, I sometimes make Tippi Hedren jokes, especially when gulls or blackbirds are involved, but I've never felt stalked. This time, though, I got a fish's view of a predator, totally by mistake. Sandy Hook's varied habitats offer several different places to bird, depending on what you'd like to see. My first choice today was an area at the tip of the hook called the locust grove, known to attract warblers and other songbirds. It's nestled between Battery Peck and the northern end of Nine Gun Battery, accessible from a gate in the chain link fence, and it leads out toward the pond on the Fisherman's Trail. during the event described in this post. The farther north you go on the hook, the more likely you are to see Osprey, and I was thrilled to see a half dozen or so in the air as I got out of my car. Where it was once news to see one nesting pair at Sandy Hook, the population has soared in recent years. By my informal count, there are at least five active nests on the hook this year. Some are on platforms built by the National Park Service specifically for the Osprey. Others capitalize on existing man-made structures like a radar tower on the Coast Guard base and, despite the efforts of the NPS, the chimneys of a few Fort Hancock buildings. Their success says a tremendous deal about the improved health of Raritan Bay and the efforts of environmentalists to make the region more hospitable to the ol' fish hawk. Thing is, there are so many of them that you have to wonder where else they're nesting. A couple of years ago, I was scolded away from Battery Kingman by an angry Osprey parent protecting its young, and there are other platforms tucked away in locations less accessible to human wanderers. I think that's how I got into trouble today. I was probably about a third of the way down the locust grove path when I heard insistent peeping from the sky. Looking up, I saw three Osprey -- two circling broadly and a third hovering almost directly above me. I kept walking, only to look up again to see the same bird over me, now flapping its wings busily. I'd seen that flap before, but over water: it's the maneuver of an Osprey readying itself to strike at a fish. Hmm. Perhaps it's time to look for birds elsewhere. 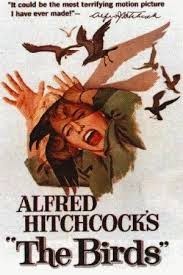 In the Hitchcock masterpiece, the birds' hostility comes out of nowhere. My experience is easily explained. The closer I got to my car, the less disturbed the Osprey seemed to be, leading me to conjecture that I'd unknowingly approached a nest. By this point in the season, they're well-established and already incubating two or three eggs, one parent keeping the unhatched offspring warm while the other guards the area or goes fishing for the family. They've got enough to worry about from predators without having to warn me off. A big part of birding is understanding the place of the human. We're there to observe and enjoy but not to disturb or harass. When a normally-quiet bird like the Osprey starts to vocalize, or a usually sweet-sounding songbird calls harshly, it's a cue to depart. We know our intent is pure, but the bird doesn't. Birding is good all over the hook; I had no specific need to be on the locust grove trail. If the Osprey wanted me gone, I was more than happy to cooperate. Plymouth Rock at Echo Lake? We run into plenty of historic markers -- plaques on boulders -- in our travels. Every once in a while, they're head scratchers. For instance, there's the one in Union County's Echo Lake Park, situated near the western end of the lake. It's not far from the intersection of Route 22 and Mountain Avenue in Mountainside. 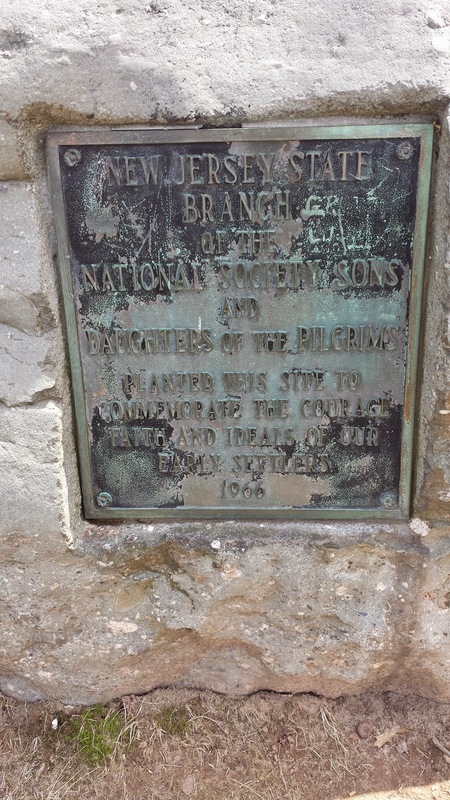 If you can't quite make it out, the inscription reads: "New Jersey State Branch of the National Society Sons and Daughters of the Pilgrims planted this site to commemorate the courage faith and ideals of our early settlers 1966." I'm all for memorializing the people who helped found the country, and when I researched the Sons and Daughters of the Pilgrims, I discovered that's the business they're in, so to speak. Founded in 1908, the organization's members are the descendants of people who came to the New World before 1700. Their ancestors didn't have to have come over on the Mayflower, but they've been around a loooong time. And part of their mission, beyond encouraging the study of Pilgrim history, is to create "durable memorials of historic men, women, and events." So that explains why the New Jersey chapter would invest in placing a good sized brass plaque on a very large stone in a public place. 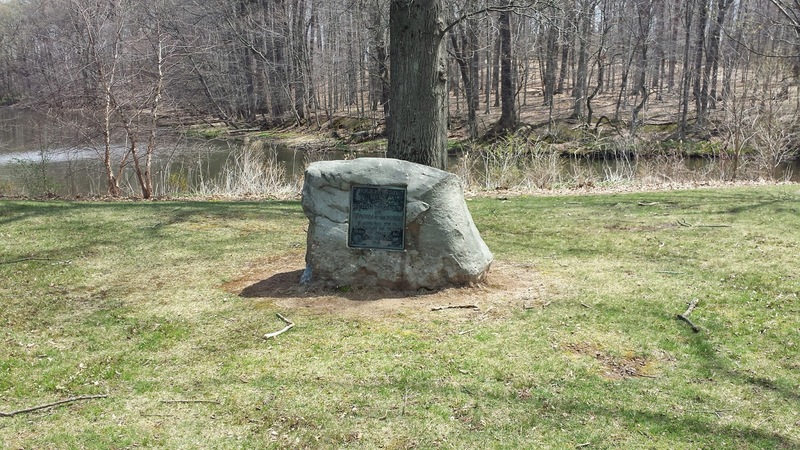 It doesn't explain, however, why the plaque and stone would be placed at Echo Lake. While it's a well-used park, it doesn't have the visibility of a downtown location in a major city, and that part of the park gets much less visitorship than other areas. Someplace in Military Park in Newark, or even within the grounds of the Presbyterian Church in Elizabeth would be more fitting, considering the founding dates of both cities. Why, indeed, does Union County need its own Plymouth Rock? Your guess is as good as mine, but I do have a theory, fueled by the relatively recent appearance of a series of historic markers on nearby Mountain Avenue. Signs for the Washington-Rochambeau Revolutionary Route (or W3R) mark the path taken in 1781 by the Continental Army and ground forces sent by France to help American forces finally defeat the British. Starting in Boston where more than 4000 French officers and troops landed, and extending south to Yorktown, Virginia, the route actually diverges in New Jersey, reflecting the more westerly route the French took (more or less along current day Routes 202, 287 and some county roads) and the easterly route Washington's troops took (attempting to convince the British of yet another possible attempt to invade Staten Island) before heading toward Trenton. The Mountain Avenue segment is part of that easterly route. Knowledgeable as they must be about colonial history, had the New Jersey Pilgrim sons and daughters deliberately chosen to plant their memorial in Mountainside alongside this pivotal Revolutionary route? Or was it just a happy coincidence? Or maybe the answer is much simpler. In time-honored Jersey tradition, could it be that the Pilgrim descendants just knew a guy at Union County Park Commission who could get the stone placed? Who knows? Stranger things have been known to happen. What do Johnson & Johnson, a good brisket sandwich and art have in common? Interestingly enough, Rutgers University and New Brunswick, sort of, by way of George Segal. That's George Segal the artist, not George Segal the actor. A lot of people don't realize it, but Rutgers' New Brunswick campus was at the center of a vibrant and influential art community in the late 1950s and early 1960s. For example, now-legendary Pop artist Roy Lichtenstein was a professor in the Douglass College art department, right around the time Rutgers College instructor and performance art pioneer Allen Kaprow was beginning to conceive of what became known as Happenings. Enjoying both the proximity and distance from Manhattan's scene, they and others found the freedom to experiment on radical new ideas. Segal found his way from his native New York City to Central New Jersey in 1940 when his father bought a chicken farm in South Brunswick as part of an organized effort to boost food production during the Great Depression. After briefly attending Rutgers, he studied art at Cooper Union in the early 40s and Pratt Institute several years later, marrying Helen Steinberg, the girl next door, in the interim. Ultimately he earned his bachelors degree at NYU, graduating in 1949 with a degree in art education. The Segals bought their own South Brunswick chicken farm in 1953, but when finances got tenuous, he started teaching English and art in local high schools. Kaprow lived nearby, and the two became friends, with Segal's paintings eventually becoming part of Kaprow's exhibitions. The pair also shared wall space in New Brunswick's Z&Z Kosher Delicatessen in New Brunswick, perhaps hoping that patrons would fancy a nice piece of art with their kreplach. as installed at the Newark Museum. Eventually, Segal's worlds combined: he hosted one of the first Happenings on the chicken farm and began using poultry netting (chicken wire) to frame out the basis of plaster sculptures that he'd arrange in front of painted canvases. He soon abandoned the wire in favor of placing plaster-soaked J&J gauze bandages directly on his models, reportedly coming upon the idea after one of his students gave him the material doctors used to create plaster casts for broken bones. Segal would plaster his models with the gauze, allowing it to set only to a certain firmness, then gently removing and reshaping it back to its three-dimensional form. Thus he'd have a fully-formed, accurate human being, albeit in ghostly white. He'd then place the form -- or several -- into a tableau that he called an 'assembled environment.' It might be a group around a kitchen table, couples on a park bench (as in New York's Christopher Park) or a toll collector in an authentic Holland Tunnel booth (as in the Newark Museum's garden). Segal's molding methods evolved over time, allowing him to create intensely lifelike details in his plaster sculptures. Understanding that his models had to stay in the same posture for more than a half hour as the plaster hardened, he came to realize that what he was capturing was not a pose or posture, but the subject's actual true stance, revealing a great deal of who they were as people and lending truth to the art itself. Over the decades, Segal's art has been installed widely -- chances are you've seen either the plaster works or those cast in copper, like the Breadline installation at the FDR Memorial in Washington D.C. If you're like me, they've prompted you to want to participate somehow. Maybe you've found yourself wanting to line up with the hungry men waiting on the bread line, or maybe handing fare to the toll collector at the booth in the Newark Museum Garden. Either way, they've drawn you into their lives and made you wonder: what's on your mind? What challenges are you facing today? And perhaps, in some small way, they've encouraged you to consider the same questions about yourself. Segal eventually became successful enough as an artist to leave teaching behind, but he maintained a 6000 square foot studio at the South Brunswick chicken farm until his death in 2000. Whether he still had chickens at that point, I don't know. The opening day of fishing season in New Jersey was a great day to take a good wander around the countryside, and I found myself once again traipsing through Warren County, partially on Route 46, some on Route 31 and finally on Route 57. This time I was off to find a concrete house built by an employee of Edison's Portland cement company, and I actually found it, though not without a bit of discovery along the way. I mention fishing season because it seemed I couldn't go very far without seeing anglers casting their luck for the first time in 2015. Both the Pequest and the Musconetcong Rivers were popular, with clutches of waders-wearing fishermen standing midstream or on the banks. After taking a turn off Route 57 south of Port Colden, I found myself on Changewater Road, driving along fields, past a few McMansion enclaves and finally to the small community of Changewater. The road bends and quickly descends to the level of the Musconetcong River, which splits into upper and lower branches there, giving the hamlet its name. An old one-lane bridge crosses the river at that point, and when I arrived, a few vehicles were parked in a small gravel-covered lot on the Warren County side. Yup -- more anglers capitalizing on a nice day for fishing. However, that's not why I stopped. I stopped for the monoliths. A couple of dark old cut-stone columns stood on either side of the river, and when I got out of the car to check them out, I noticed they lined up with stone structures farther up the hills on either side of the road. If you drew a straight line along the top of the several columns, you could imagine train tracks stretching across what's basically a ravine. It put me in the mind of the better known Paulinskill Viaduct, which, though made from cast concrete rather than quarried stone, is similar in that it just kind of jumps up on you when you least expect it, in a seemingly unspoiled environment. The trestle, back in the day. As it seems with so many other discoveries we make, the age of the trestle depends on who you ask. Even the twin markers on the Hunterdon County side disagree -- an older sign saying the railroad ran there in 1856 while the newer placard says 1862. Both agree, however, that the railroad, owned by the DL&W by that point, stopped running there by 1960. The rails were removed, presumably along with the track bed, at that point. I'd have to find an old railroad map to be sure, but I'd venture to guess that this stretch was connected with the length that once ran behind Shippen Manor, which was pretty much rendered secondary, and less profitable, when the Paulinskill Viaduct shortened the route to Scranton. On its own, Changewater has a neat little story once you do a little digging. Originally home to a colonial-era iron furnace, it was apparently a productive hamlet during the 19th century. 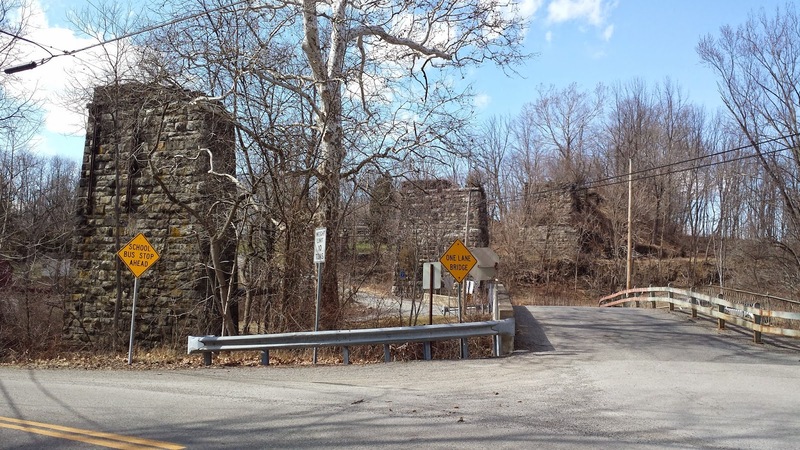 The Washington Township website notes that at various points, the village had hosted a snuff factory, a flour mill, distillery, tannery and a picture frame factory, as well as a railroad station. Locals could grab the train there until passenger service ended in 1926. 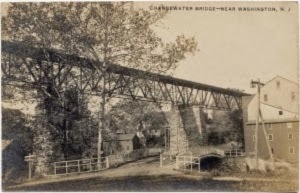 Nowadays, Changewater still has a post office, but the community is mostly residential in nature, offering the type of village living many think is impossible to find in New Jersey. Whether the fishing is any good on that stretch of the Musconetcong, I couldn't tell you, but I'd venture there are a lot worse places to be on a sunny spring morning. And as for that concrete house I mentioned? That's a story for another day. I have to admit to being a bit confused when I discovered that George Washington lived in Mendham. I stumbled on this fact during yet another aimless drive through Morris County, accompanied by the WPA Guide to 1930s New Jersey. Finding myself in Mendham I flipped through a few pages of the manual to discover that somewhere along County Road 510, the Old Route 24, "An overgrowth of tall trees and thickets... hides from the road the Estate of George Washington, coffee manufacturer." Or at least it did in 1938. That certainly got me curious. Thing is, the connection between the Father of our Country, coffee and Mendham wasn't that clear to me. While wintering in Morristown, did General Washington have a little hideaway, just a few miles distant, where he discovered the secrets of a good cuppa joe in his spare time? The Ford Mansion may have been the Pentagon of the Revolution, but I'd never heard Mendham referred to as the Coffee Pot of the Revolution. Okay, I'm having a bit of fun, but there indeed was a George Washington who lived in New Jersey in the 20th century and ran an eponymous coffee company in Morris Plains. The java-loving Washington was an Anglo-Belgian chemist who immigrated to the United States with his wife in the 1890s. An unsuccessful businessman -- he tried selling kerosene lamp mantles and cameras for a time -- he eventually attempted cattle ranching in Guatemala. It was there that inspiration struck. As the story goes, one day as he was waiting for his coffee to brew, he noticed a residue forming on the spout of the pot. Curious about the substance, he began experimenting and eventually found a way to make a form of soluble coffee that could be brewed instantly. Other inventors had already developed similar products, but Washington's work was the first to lead to a commercial venture. The G. Washington Coffee Refining Company was formed in 1910, with production facilities in Brooklyn. By the start of World War I, Washington was ready to meet the demand for a coffee that could be made quickly in the field to keep troops awake and alert. The taste of the instant variety was far inferior to the traditionally brewed coffee, but it could be manufactured double-strength and even be drunk cold, perfect for the trenches. Used first by the Canadian Expeditionary Forces at the start of the war, it was adopted by the American military once the U.S. entered the conflict in 1917. Some say that at a point during the war, the U.S. Army requisitioned Washington's entire coffee output to ensure that doughboys would always be able to count on a cup of George. Washington relocated the company from Brooklyn to Morris Plains in 1927, also purchasing a home for his wife and himself, a 200 acre Mendham estate which once belonged to Governor Franklin Murphy. The grounds were soon filled with a menagerie of exotic animals the coffee magnate had assembled while living on Long Island; reportedly he eventually expanded his collection to include zebras, llamas and deer in addition to many rare birds. George Washington retired from the coffee business in 1943, at the age of 75, selling the company to American Home Products. He died three years later. While the coffee line was terminated in 1961, a spin-off brand of seasonings and broth developed in 1938 continues to this day.